of details of life at the Derwenthorpe development. Thank you Joseph Rowntree Foundation. It’s hard to see that the lifestyles of motorists are compatible with continued life on Earth. 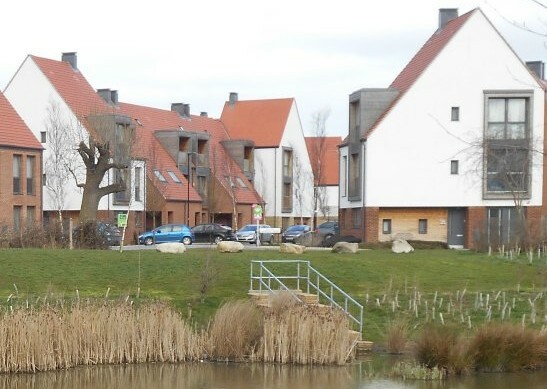 Let me give an example: The Joseph Rowntree Foundation got researchers at the University of York to look at the new development at Derwenthorpe, York, using their REAP Petite software. Derwenthorpe was meant to be sustainable and have a low carbon footprint but it achieved a planet-destroying footprint of 14.52 tonnes CO2e per resident per year. This was worse than the average for York as a whole, which was still planet-destroying at 14.30 tonnes CO2e. Although, Derwenthorpe residents have lower emissions due to the central wood chip burner that provides their heating, their carbon footprint for travel was estimated at 45% higher than York’s average. Car use is an important part of this : “Despite only one car space per household, few households had reduced their car use substantially”. it should be noted that, compared with the national REAP Petite sample, Derwenthorpe REAP Petite respondents are skewed towards higher income households with the richest 10 per cent of households nationally consuming three times more carbon for household energy and travel than the poorest 10 per cent. Wealthier groups than Derwenthorpe residents will have even higher carbon emissions – and even more cars. What’s the message? It’s: Housing built for affluent motorists cannot be regarded as sustainable. Car-free development should be the starting point for all development proposals in places that are (or are planned to be) well-connected by public transport, with developments elsewhere designed to provide the minimum necessary parking (“car-lite”). The new National Planning Policy Framework. compromising the ability of future generations to meet their own needs (4) . Paragraph 3 demands sustainable development and Paragraph 4 demands an equitable sharing of the environmental costs of economic development “between and within countries”. “Equitable sharing” means it is not valid to make plans that allow high emissions and expect other countries to reduce their emissions to compensate. This means that plans for residents with large greenhouse gas emissions are not compatible with UN Resolution 42/187: The residents of other countries should not be expected to limit their emissions to compensate. Consequently, such plans are not compatible with the new NPPF. Most greenfield developments in most local plans in the UK break the new NPPF. On recent example is the latest York Local Plan, which is planning for nearly 15,000 homes to be built. Most of these will be acquired by the affluent with high carbon footprints. If the new NPPF is taken seriously, planning for the high carbon lifestyles of affluent motorists is now illegal. ‘stealing their future in front of their very eyes’. 1. BECCS will remove billions of tonnes of CO2 from the air. Anyway UN Resolution 42/187 and the new NPPF are clearly violated if we plan for affluent, planet-destroying motorists. Electric cars are not the answer. Lomborg is right about that. Made with current sources of electricity, an EV creates carbon emissions from its manufacture that may be too large (See The carbon cost of achieving low carbon lifestyles). When electricity is decarbonised, this will improve but in the time before low carbon electricity, we must look for other options: shorter journeys and less frequent trips. With shorter trips we could travel slowly in lighter vehicles making our travel more efficient and less carbon intensive. Locally that could mean pleasanter, quieter narrower roads – more like cycle tracks – and safe for electric golf carts, Segways, Giroboards. Separate developments for non-motorists makes living much cheaper and pleasanter – for the non- motorist. So much so that many motorists will give up their cars to join in. An analogue is the case of smokers on trains. When carriages were separated into smoking and non-smoking. he smokers could dwindled: They could not stand their own pollution. New developments for non-motorists should be added to existing settlements, with facilities that could be used by nearby neighbourhoods to help them become car free.